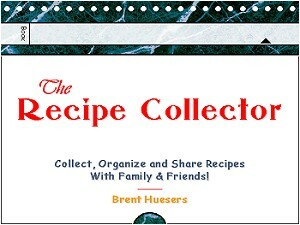 The Recipe Collector, Collect, Organize and Share Recipes With Family & Friends by Brent Huesers, is the ultimate organizational tool for all recipes and cooks everywhere! You will be able to enter and find recipes easily and quickly. Have all your favorite recipes at your finger tips—No more messy recipe cards! 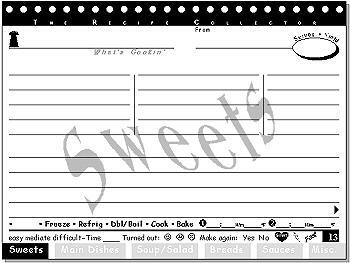 Contains 95 blank recipe cards plus a 120+ Ingredient Substitution table, Measures & Conversions table, Seasoning Guide, plus more! It's so simple—and fun! Create a "Family Cookbook": Don’t let favorites get misplaced, kids will ask for them when grown up. Get Organized: Simple to do—and Fun! Never loose a recipe again! Complete: Everything you will need, in one spot. Give a Gift: Weddings, College students leaving home, Family cookbook, etc. Reference Tables: Ingredient Substitutions, Temperature Conversions, Measures & Conversions, Seasoning Guide, More! Page Number. Manually index the recipe in the front of the book (makes lookup fast).